Bible Verses about strength must start and end with God. It is the power and strength that comes from God that carries us on. As Christians we need to surrender to the strength that God provides and His strength is made perfect in our weakness. As you read through these scripture quotes about strength be encouraged in that it is not your strength that is needed but the strength that God willingly supplies. Feel free to use this study for a devotional, topical Bible study or Sunday School lesson. It is so refreshing to know that we can rest in the strength and comfort that God will provide when facing troubles of many kinds. Let Him have the glory and show himself strong. Listen to this Bible verse: 2Chronicles 16:9 For the eyes of the LORD run to and fro throughout the whole earth, to show Himself strong on behalf of those whose heart is loyal to Him. In this you have done foolishly; therefore from now on you shall have wars.” God wants to show Himself strong on your behalf. Surrender to Him today and let the peace that He gives you take over. We cannot fully serve God without full surrender to his Strength. Isaiah 40:28-31 Have you not known? Have you not heard? The LORD is the everlasting God, the Creator of the ends of the earth. He does not faint or grow weary; his understanding is unsearchable. He gives power to the faint, and to him who has no might he increases strength. Even youths shall faint and be weary,and young men shall fall exhausted; but they who wait for the LORD shall renew their strength; they shall mount up with wings like eagles; they shall run and not be weary; they shall walk and not faint. Psalm 119:23 Even though princes sit plotting against me, your servant will meditate on your statutes. The following Bible verses on being strong show us biblical examples of strength and the faith it takes to trust in God so completely that He is your strength. Imagine how much faith it took for Abraham to be willing to sacrifice his long awaited son Isaac. 1 Samuel 30:6 And David was greatly distressed, for the people spoke of stoning him, because all the people were bitter in soul, each for his sons and daughters. But David strengthened himself in the LORD his God. Genesis 22:1-3 After these things God tested Abraham and said to him, “Abraham!” And he said, “Here am I.” He said, “Take your son, your only son Isaac, whom you love, and go to the land of Moriah, and offer him there as a burnt offering on one of the mountains of which I shall tell you.” So Abraham rose early in the morning, saddled his donkey, and took two of his young men with him, and his son Isaac. And he cut the wood for the burnt offering and arose and went to the place of which God had told him. Are you struggling through a situation today and are grasping for answers? How should you respond? Respond with faith and not fear, knowing the promises of God and His mighty hand will hold you through any situation! Matthew 21:21 And Jesus answered them, “Truly, I say to you, if you have faith anddo not doubt, you will not only do what has been done to the fig tree, but even if you say to this mountain, ‘Be taken up and thrown into the sea,’ it will happen. Jesus has truly overcome the world the day he gave His life for all on the cross. Take peace and be encouraged knowing it is Him who is mighty to save. He will not leave you or forsake you. Do not lose heart or become discouraged as we have the Hope of Jesus Christ and eternal life to carry us through. Stay in the Bible and pray continually seeking the face of God and He will be with you. I pray these Bible verses fill your heart with hope from the truth of God’s mighty word. Romans 5:5 and hope does not put us to shame, because God’s love has been poured into our hearts through the Holy Spirit who has been given to us. D.L. Moody once said that “If you partner with God, Make your plans big!” I encourage you today to make God your partner. Whatever your burden is that caused you to search for strength, give it up to him now. Do not let another minute go by without completely surrendering your burdens to Him. God wants to be your strength. Surrender to Him in your weakness and let Him show Himself strong. 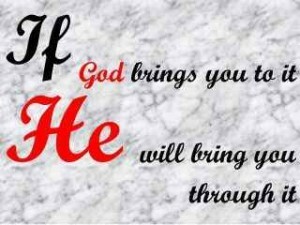 Remember if God brings you to it, He will bring you through it!